This recipe has 5 stages. 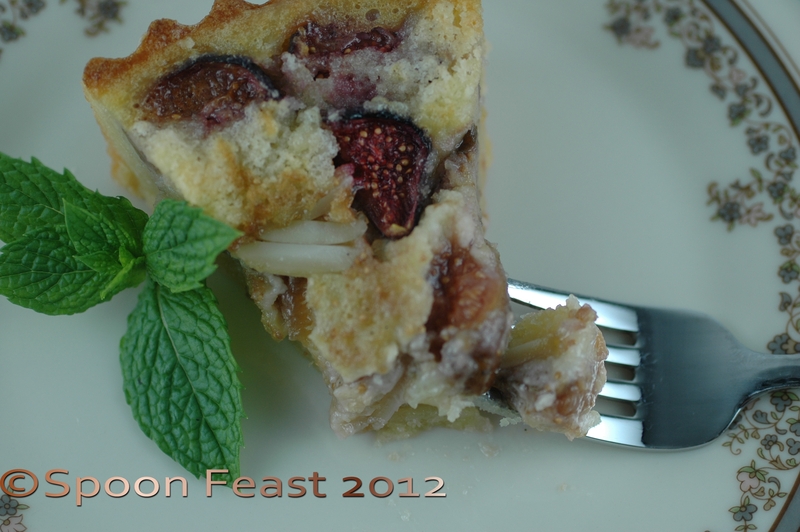 You will make sweet tart dough, frangipane, and sauté figs to make a jam, blend eggs for custard and then assemble and bake a beautiful tart. You can make this in stages or in an afternoon, whatever you have time to do. What is frangipane? 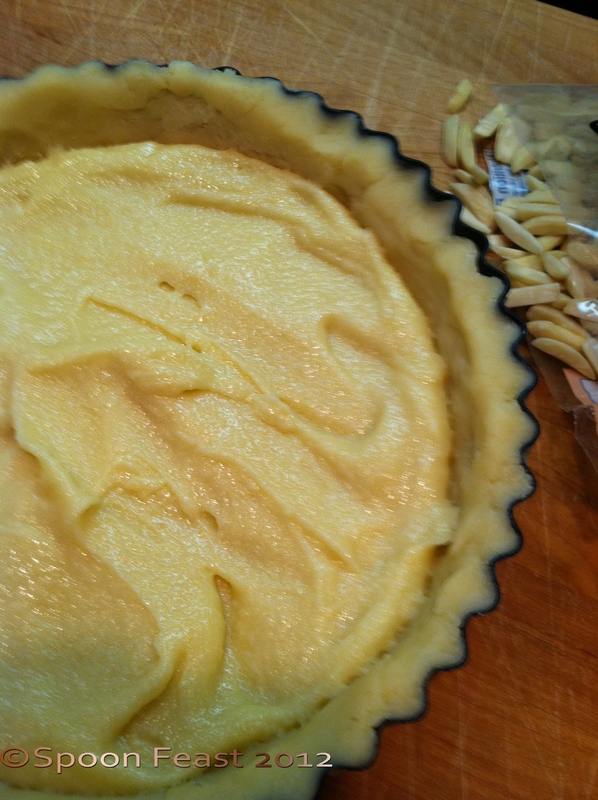 Frangipane is a finely ground mixture of almonds, sugar and eggs. It is used as a filling for fine pastries: almond croissants, Danish pastries, underneath fruit in a fruit custard pie such as this recipe. 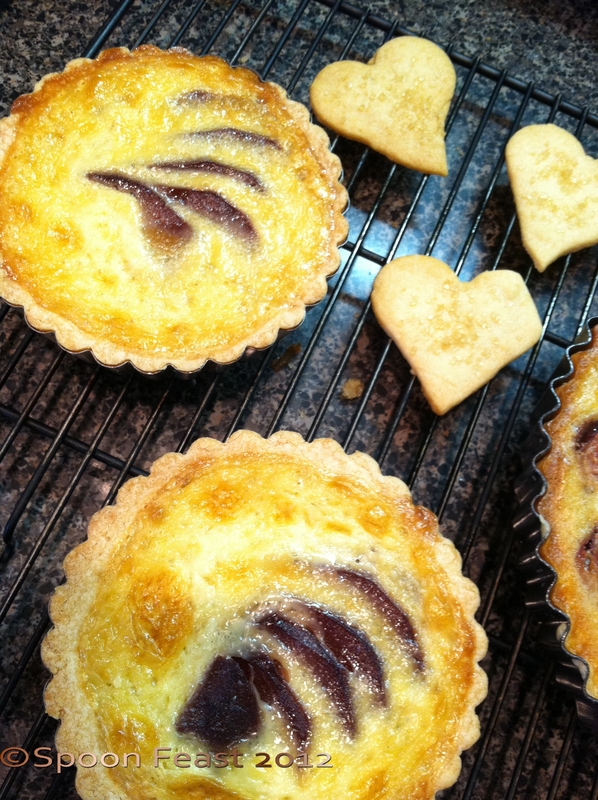 Frangipane is very similar to marzipan which does not have eggs. Frangipane must be refrigerated or frozen. If kept fresh, use it within a week for best flavor. You will have some of these components left to make other things with so get creative! The Port Poached Pears are in my “Draft” box. 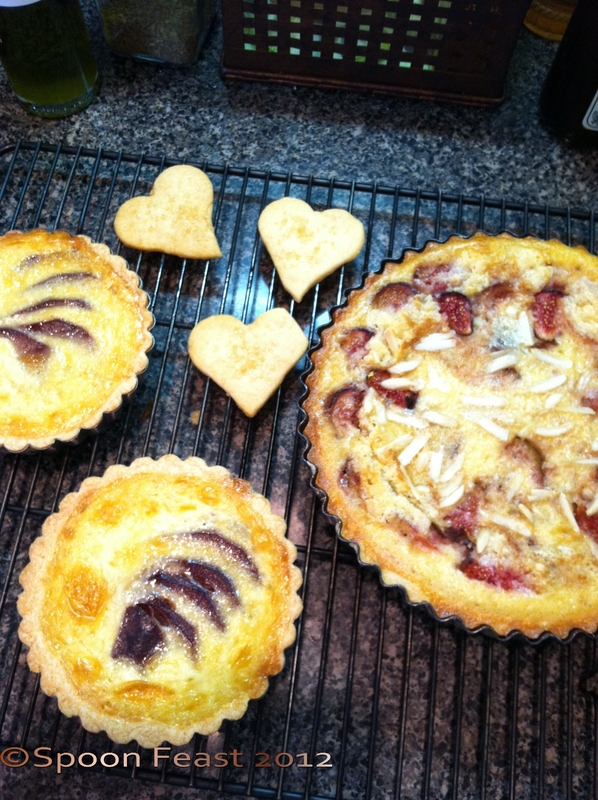 I had sweet dough, frangipane, and custard left so I made two smaller tarts and topped them with Spicy Port Poached Pears. Scatter the flour mixture over the butter, add the egg and process just until the dough forms a mass; do not over mix. Line a greased 9 1/2 inch tart pan with half the dough and chill for 30 minutes. Keep the other half for another use. Place the sugar and the slivered almonds in the bowl of a food processor and process until finely ground; about 2 minutes. Add the eggs and the almond extract, if using, and process until smooth; about 1 minute. Add the flour and process until combined. Use ¾ cup for this recipe. Extra frangipane can be frozen until another use. 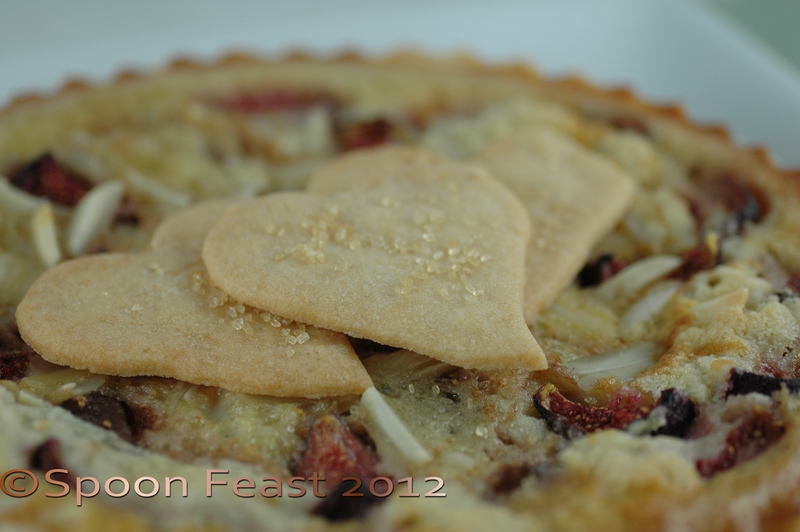 Use fresh frangipane within a week if kept refrigerated. 2 pints fresh figs, quartered. Melt 2 tablespoons butter in a large pan, add the vanilla seeds and beans and the quartered figs and sauté until they have a jam like consistency but retain their shape. Use sugar to taste. * Often you don’t need it. Whisk together the eggs and sugar in a medium bowl, about 3 minutes. Whisk in the cream and cognac. Spread an even layer of frangipane over the prepared tart pan. Bake for 14 minutes, until the frangipane layer is puffed but not set. Bake the tart at 350 degrees F. for 50 minutes. The crust will be golden. After making the tart, I had some ingredients left over. 2 small port poached pears with frangipane and custard and some decorative cookies from the remaining sweet tart dough. 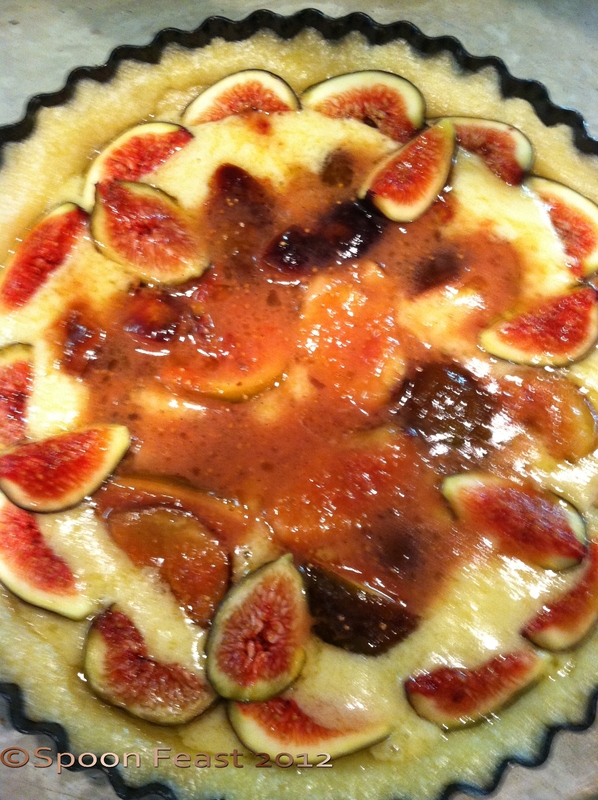 Add the fig ‘jam’ mixture on the baked frangipane layer, inside of the fresh fig ring. 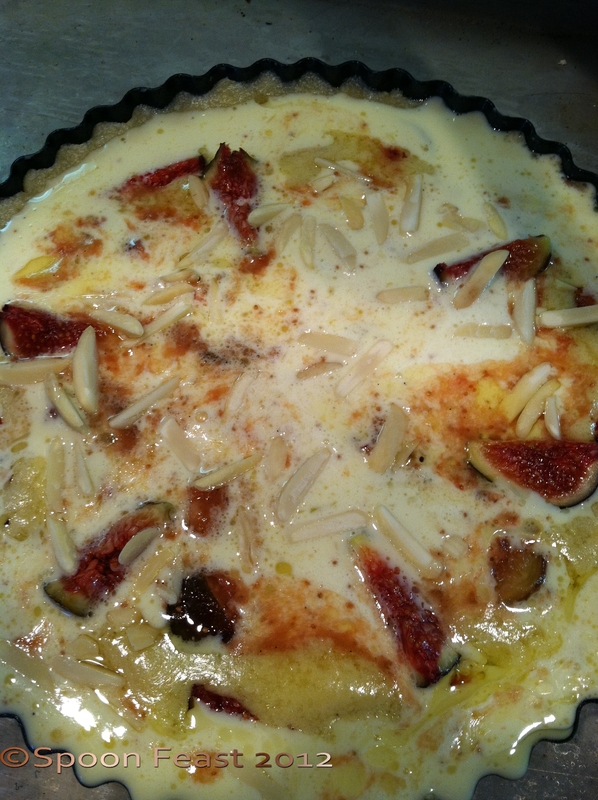 Pour the custard mixture over the figs. Sprinkle the top with some slivered almonds. Cool the tart completely on a wire rack before cutting and serving. This is an elegant tart. After putting all your time and effort into it, make it an occasion to eat it! Make up one if you have to. 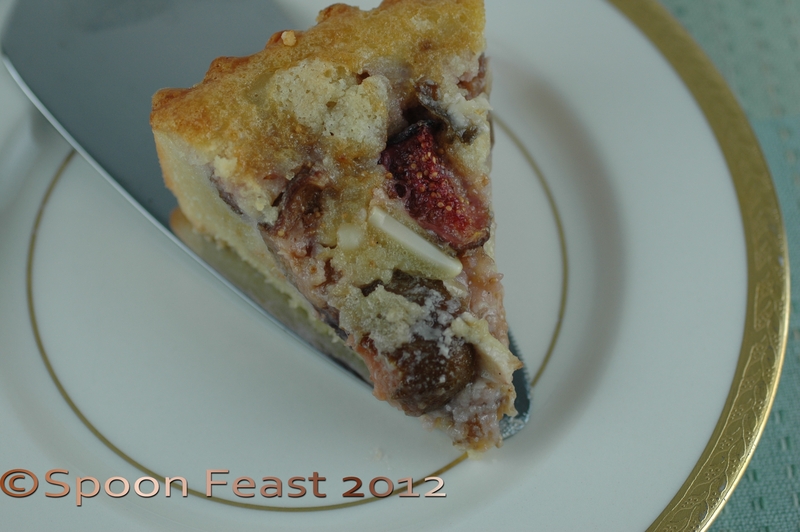 This entry was posted in Recipes and tagged Almond, fig and almond tart, fig tart, figs, Frangipane, fresh figs. Bookmark the permalink. Absolutely decadent! I adore figs and wish that they were in season at the moment but alas I shall have to wait patiently for our tree to produce fruit late this year. Lucky you to have a tree. Here’s to an abundant crop next year. Yes, figs here are ripe but only for a short while. I have missed you and re-subscribed to your blog as I was not getting your updates! Your crackers, blueberry sourdough and the cinnamon bread (next on my list) are amazing. Everyone should be following you!